Below are our direct drive and linear motor products. Each can be modified and configured to meet your specific needs. Contact us if you don’t see exactly what you are looking for. We can help you identify the right motion solution for your application. The MMX™ & MMG™ series miniature linear stage has a low profile design with high power linear servo motor options. The MAG™ series servo linear actuator utilizes a moving magnet design and linear servo motor. The Airglide™ air bearing stage design uses precision stiff air bearings for large payloads. FiberBeam™ linear air bearing positioners are designed for high accuracy in a low profile. The XYR™ series XY positioning stage is our most popular XY linear stage and uses a lead screw for motion. The monolithic integrated XY center makes the stage stiff and compact. The XYRB™ series precision XY stage is similar to the XYR™, but incorporates a ball screw for more precise and repeatable positioning. The encoder option improves accuracy. The XYA™ series XY linear stage has the motors and controller embedded within the stage structure for a cleaner appearance and less external cabling. The XYL™ series has the largest table size, longer travels, and larger bearings for a stiffer platform that can handle larger payloads. The OFS™ series inverted microscope XY stage of open frame XY tables combines low-profile, two-axis positioning with an open aperture. The OFL™ series motorized XY stage provides increased travel and load bearing capacity in an open frame XY configuration. The XYMR™ series microscope stage brings automated, highly accurate XY positioning to a wide range of microscope-based applications. 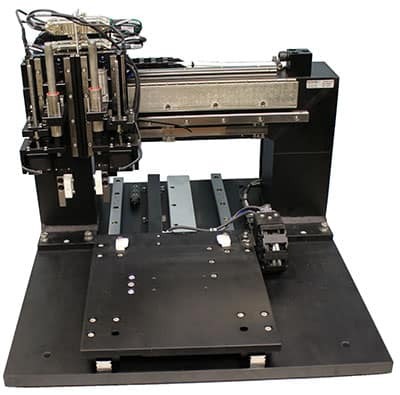 The DDM™ series direct drive motorized microscope stage provides quiet motion with the best accuracy and repeatability of the open frame series. The FM™ series is a ball screw linear stage with a stiffer table and larger crossed roller bearings. The KV™ micro linear stage is a lead-screw-driven step motor stage with a miniature size. 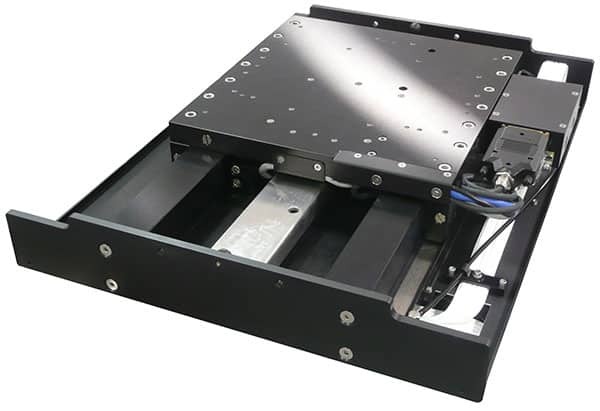 Our elevator wedge Z stage provides a small footprint with a 200-millimeter-square moving table. The LM™ series linear motion slide is a low-cost, single axis stage with crossed roller ways and stepper motor. The LMB™ series ball screw linear actuator is a high-precision, single-axis stage with crossed roller bearings. The Airglide™ air bearing stage design uses prevision stiff air bearings for large payloads. The Dover SAX gantry stage is a versatile split-axis XY gantry system utilizing high-efficiency, non-contact, ironless linear motors.